The Dakota Shoulder Bag in the colorway Rawhide by Mona B. is a boss among shoulder bags. Its substantial size and durable features will meet your wants and needs for a favorite ready-to-go bag. 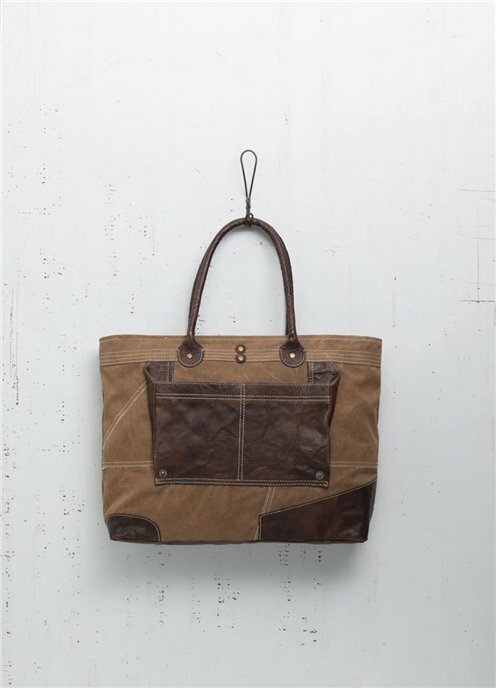 The umber upcycled canvas construction has detailed stitching and leather trim in coordinating deep brown to give a rugged, relaxed look. On the front there is a large leather dual open pocket, for easy access to phone or keys. The leather base adds durability and protection. On the back there is a zipped pocket. Leather handles have a 7.5" drop. Access the interior through the leather trimmed zipper at the top. The interior is lined with the signature Mona B. cotton lining, and contains 2 slip pockets and one zipped pocket. Measures 20"W x 13.5"H x 4"D. Made from up-cycled canvas. The fabric shows the history of its travels which may include stitch marks, minor staining and unique scars and bruises. Color variations and patches add to the uniqueness of each bag. Heavy cotton canvas and genuine leather.